On Palm Sunday we remember how Jesus entered Jerusalem to the praises of His followers. They placed the branches of palms on the road to make a path. 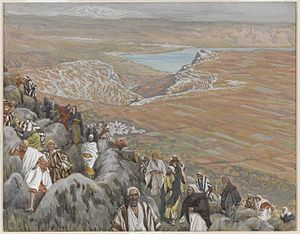 Most even took the cloak off their back and placed that on the road to make Jesus’ path. (Matt. 21:8) Would you do that? Would you ruin a perfectly good cloak to make way for your Savior? Do you know how hard it is to get out donkey stains? Remember what happened next? Jesus went to the temple and found the place full of greedy selfish people. They were “helping” outsiders – guests – by changing their foreign currency into the proper form so that they could buy the animal for sacrifice. They were ripping people off! The church was full of guests. But the scribes and chief priests could think only of profiting off of them. After all, these people only come to the Temple once a year. Jesus – in righteous anger – dumped over the tables and drove those crooks out of the temple yard. Temple was to be a place to spend time in prayer and to know the Father. If it troubles you to think about Jesus’ show of anger, just remember that in a few days he would die for the sins of these money changers. When guests show up for Easter services next week, let us be humble. They are not here so we can be proud of how full building is. (Not for our profit) They are here to seek and to find the Savior, the Redeemer. They are here at the invitation of the Father. Take off your cloak and lay it down to make a path; a path that leads them to Jesus. Let’s all humbly serve our guests next week and every week. In the name of Jesus.